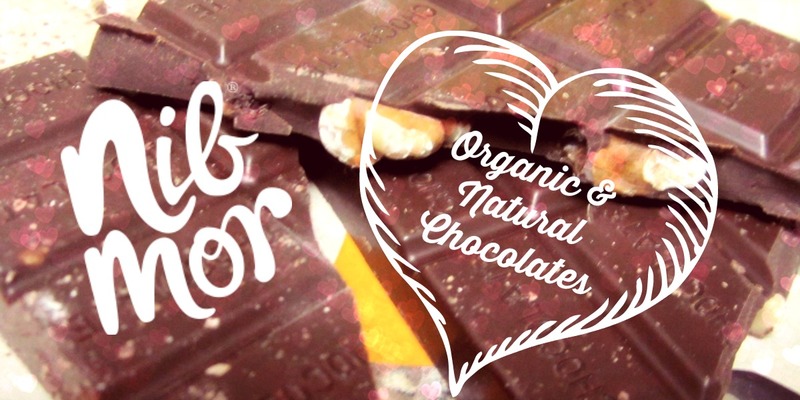 I am a huge chocolate fan from way back, and I've had so much fun this past month discovering NibMor Organic & Natural Chocolates. From what I understand, if you live in NYC or the Kennebunk, Maine area, you probably already know about this wonderful little company, but for the rest of us, I'm thrilled to have this opportunity to spread the word. The name is short for "Nibble More," and this chocolate is not only delicious enough that you'll want to do just that, but the high quality healthy ingredients means you can let yourself indulge more, too. 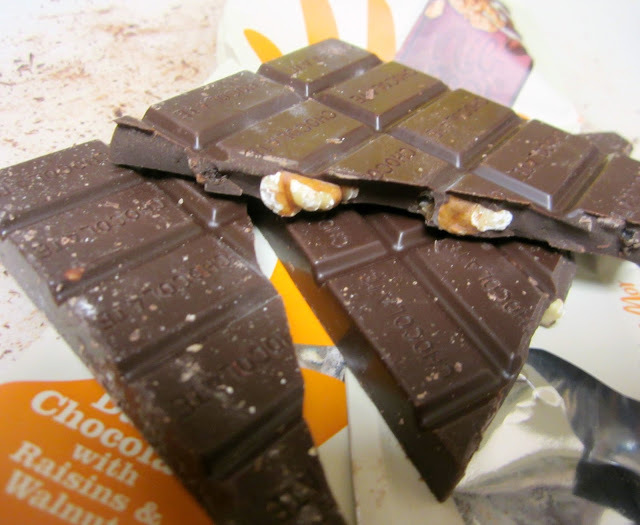 I received a big batch of chocolate bars and drinking chocolates to try out for review. I've not only nibbled and tasted, but I've used these bars in a couple recipes I'll be sharing over the next few days. For right now, though I want to tell you a few things that make this brand special, and let you know about the excellent giveaway NibMor is letting us host! 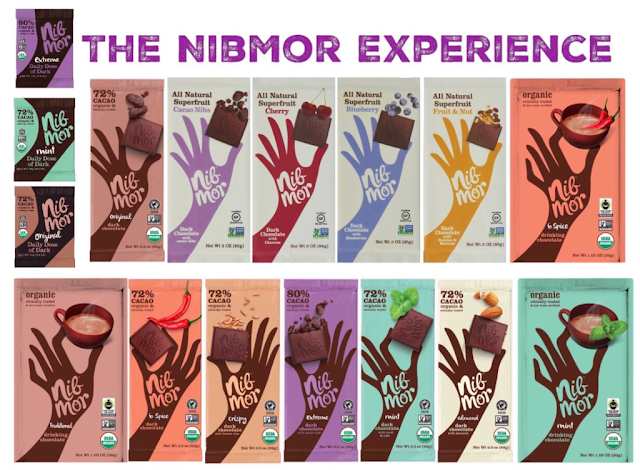 NibMor's Organic Dark Chocolate Bars come in seven varieties, each of them a generous 2.2oz bar that breaks into eight squares. I received the Original Dark Chocolate (72% Cacao), Crispy (72%), Extreme (80%) and Sea Salt (80%). In addition, they make 72% Cacao Bars in Mint, Almond, and 6-Spice. I have to admit, I was pretty intimidated by those percentages - I like dark chocolate, but I've come across several artisan brands that were quite dry and bitter, and I have tended to associate that with the higher level of cacao to other ingredients. I started with the Extreme, assuming that would be the one I liked least - but I actually enjoyed it quite a bit! One square was plenty for a satisfying snack, and I chose to set aside the rest of the bar to use the rest in a recipe. The difference between this and some of the more bitter dark chocolate I've tried seems to be that they use a good bit of cocoa butter, which gives it a much more satisfying mouthfeel and a hint of creamy richness that is usually missing in dark chocolates. So you get all the health benefits of a fine organic dark chocolate without compromising on pleasure. After seeing how much I liked the Extreme Dark Chocolate, I broke open the Dark Chocolate with Cacao Nibs & Sea Salt, also with 80% Cacao - this is basically the Extreme bar with extras. On their website, they say "... if it doesn't change your life, it will make it a whole lot better." And they are absolutely right - this is the dark chocolate I've been searching for my whole life, no kidding! I broke it into squares, and hoarded it for a delicious daily nibble. Perfection! The other two bars are 72% Cacao each - the Original is a clean, smooth bar that also has that same enhanced mouthfeel I noticed with the Extreme. Here again, I took a taste and then set aside the rest to use in a recipe. The Crispy bar adds crispy brown rice to the Original formula, giving in texture and a nice bit of nostalgia for one of my favorite candy bars from my youth. Very pleasant, and I added it to the Cacao Nib & Sea Salt bar to add to my one-square-a-day stash. Before I move on, I want to mention that NibMor Organic Dark Chocolates also come in individually packaged squares called a Daily Dose of Chocolate, just right for those of us who want to include a regular serving of antioxidants in a perfectly portioned, delicious package to their lifestyle plan. The individual packaging makes it easy to tuck them into a lunchbox or tote, so you have a portable snack to go. Each ofNibMor's Organic Dark Chocolates are Certified Organic & Vegan, Kosher, Non-GMO and use Rainforest Alliance Certified Cocoa. 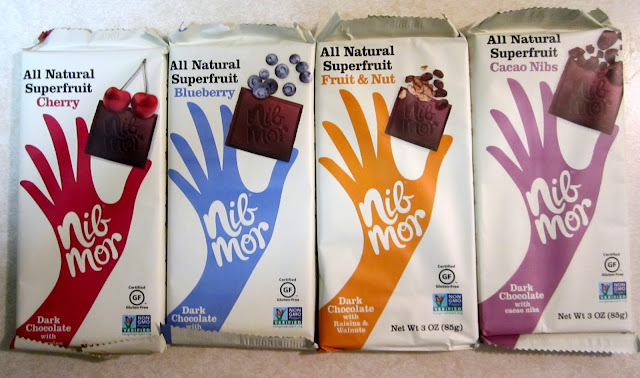 NibMor also makes a line of seasonal Natural Superfruit Chocolate Bars - these are dark chocolate bars for milk chocolate lovers, blended with enough cocoa butter that you won't even miss the milk - and the rich flavor of the chocolate and fruit and nut add-ins mean they can keep the sugar to a manageable level, which is my biggest disappointment with mass produced American chocolate - it tends to taste more of sugar than anything else. These bars are really, really good - they compare favorably with almost any bar I've ever tried, but can be enjoyed by vegans and those who can't eat dairy! The four bars contain what they they say they do in the name: Cherry, Blueberry, Cocoa Nibs or Fruit & Nut which has raisins and walnuts. They come in big 3oz bars, as well as 1oz mini bars. If you think you don't like dark chocolate, try these - they will make a convert out of you! 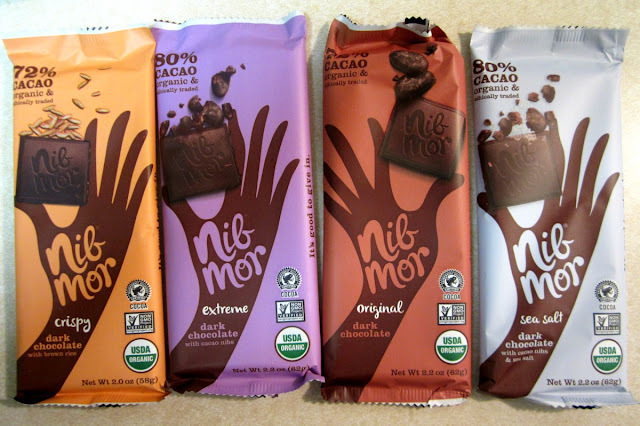 The NibMor Natural Superfruit Bars have the same indulgent richness I associate with imported gourmet chocolates, and I've been enjoying them a little bit at a time for an antioxidant-rich dessert bite. The bars break down into smaller squares than the Organic Dark Chocolate bars, and 2-4 squares at a time seem to be just right for me. Lastly, I was sent three packets of NibMor's line of Drinking Chocolates, powdered mixtures which can be blended with warm liquid, cold liquid, or used to make fancy chocolate drinks or cocktails. I'll be doing a separate post on those in just a few days, so check back! For right now I'll say that if you are needing to keep to a low-glycemic diet, you want to check these out - they have a lovely rich taste, but use coconut sugar so you can indulge without worry! NibMor chocolates are available for purchase on their website, as well as at various local area shops around the country. Right now, they are having several Valentines Day specials and sales, so this would be a great time to give them a try! Finally, NibMor is generously offering one of our US readers a box of every product they make! 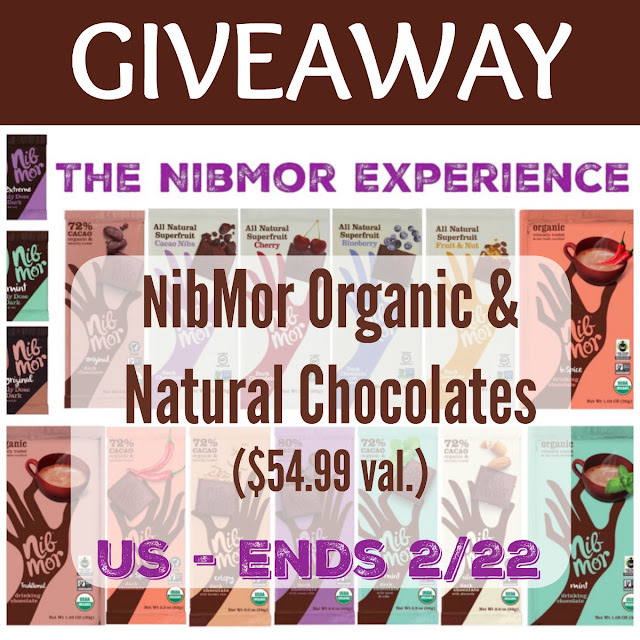 Called the NibMor Experience, this bundle is also available for sale for $54.99 and includes one each of the 7 Dark Chocolate Bars, one each of the 4 Natural Superfruit Bars, one package of each of the Nibmor Drinking Chocolate varieties and 1 4-pack of each of the 4 varieties of Daily Dose sized chocolate squares! Wow! This Giveaway is limited to US readers - read on to see how you can win! This giveaway is open to US RESIDENTS ONLY and will end just before midnight ET on 2/22. I'm most interested in the Sea Salt Dark Chocolate bars, although all of their Dark Chocolate bars sound delicious! I'd like to try the crispy dark chocolate bars! 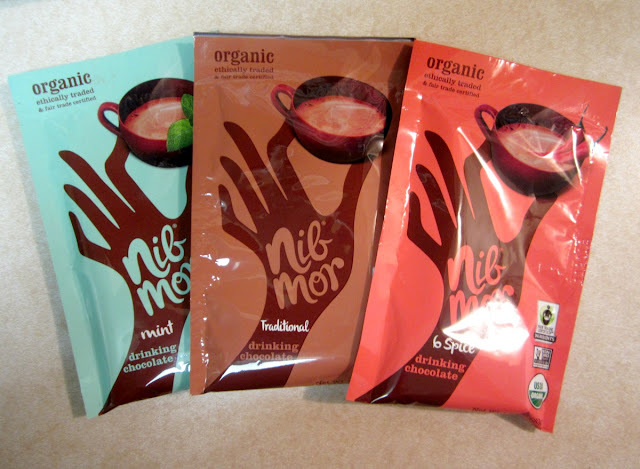 I learned that NibMor has a deep commitment to providing better-for-you chocolate including natural, organic, non-GMO, gluten-free, vegan, and fair trade products so that we can indulge mindfully every day. I would love to try their Extreme Daily Dose of Dark. I love that their products range from 55-80% cacao, and are organic, non-GMO, vegan. And the line containing superfruit is an added bonus. I feel like it'd be an excuse to eat more chocolate! Haha. I would love to try the almond bar! Haven't seen that one in stores yet. Love that everything is dark chocolate, it's the only kind I'll eat. The original dark chocolate look wonderful. Love that it is organic and dark. I would really like to try the Crispy Dark Chocolate bar. I am really interested in trying the Dark chocolate with cherry bars and I would love to get the limited edition Valentines daily dose box, it's also a great price. I would be interested in trying the cherry dark chocolate bar. I'd be interested in the mint flavor drinking chocolate. You had me at chocolate. Considering it is chilly and rainy today, the drinking chocolate grabbed my attention the most. I would love to try the Limited Edition NibMor Organic Drinking Chocolate Pack! I want to try the blueberry dark chocolate bar. Chocolate lovers would love this. Can you believe I'm not a big fan of chocolate? Crazy I know. I like it better if it's white. :) Thanks for sharing with SYC. I would like the Organic Mint Bar. I love that they use such great ingredients and I can share with my vegan friends. This chocoholic says, "I love dark chocolate!" The sea salt dark chocolate sounds tasty. 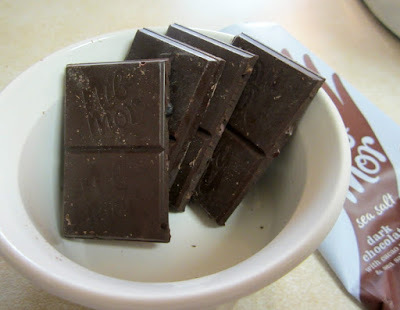 Saw your link at Blogger’s Pit Stop #60.
the drinking chocolate has my mouth watering!! The drinking chocolate is sweetened with Coconut Palm Sugar! The organic sea salt bar. I would love to try the cherry and blueberry! The new choco w/ Cherries and Blueberries looks absolutely delicious! Fruit and choco = good combo! Would love to try! I absolutely love dark chocolate so the extreme 80% one draws my eye but the crispy and mint varieties sound amazing too! And the sea salt! How could I choose just one!? I've actually tried some of the super fruit ones and thought they did a great job conveying the flavor without overwhelming the chocolate or tasting artificial! But I've never tried their original dark chocolate bars! I found that they're non-GMO. I'd love to try their dark chocolate! The dark chocolate with walnuts and raisins I love that they are organic,non gmo, gluten free and healthy yummy! The Sae Salt Dark Chocolate bar sounds yummy! I already love NibMor products! My favorite is their dark chocolate (especially the Sea Salt bar). I am not a fan of dark chocolate, however, some of the combinations do sound intriguing. Dark chocolate mint bar, yum! I would love to try the daily dose mint chocolate. I love mint chocolate and i'm going organic so this is great! I wouldl ove to try the Dark Chocolate Sea Salt bar! Yum! All of it sounds delicious, but I'd like to try Sea Salt Dark Chocolate the most! I really love to buy organic and that cherry one sounds awesome! I love that their chocolate is GMO free, Organic, and made with a great percentage of Cacao. I would love to try the dark chocolate crispy bar and the mint drinking chocolate. Everything looks so delicious. I appreciate that the chocolate is made from natural, organic, non-GMO, gluten-free, vegan, and fair trade ingredients. The crispy dark chocolate bars sound amazing, I'd love to try those and every other item that contains dark chocolate as well! I would like to try the Almond Dark Chocolate. I love almonds and this would taste great.